AUSTRALIA’S new definition of lamb is likely to take effect from 1 July 2019, pending amendments to federal and state legislation, the nation’s peak sheep producer body said today. Sheep Producers Australia’s economics, trade and industry affairs manager Stephen Crisp said there has been substantial progress in recent months, following the Australian Government announcing its support for the new definition in November 2018. “The Australian sheep industry and federal and state governments have been working hard to amend various federal and state legislation and regulations with the new definition. “All going well, those amendments will be passed in the first half of this year, with the new definition ready to take effect from 1 July 2019,” he said. 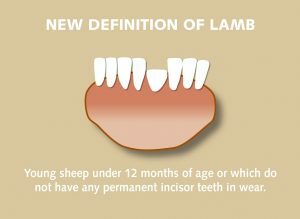 The new definition of Australian lamb will be ‘young sheep under 12 months of age or which do not have any permanent incisor teeth in wear’. SPA said this definition is consistent with New Zealand – removing the unfair advantage New Zealand producers have had over Australian producers. SPA said the new definition gives producers greater certainty and a definitive signal to make moves to market their lambs. SPA said the process for checking whether lambs comply with the new definition will be via a visual inspection – the same process used to verify lambs against the current definition. 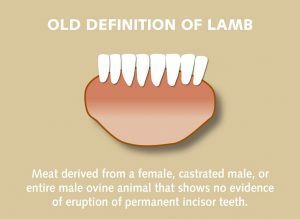 The change to the lamb definition was first announced by Sheep Producers Australia in March 2018, following extensive consultation with producers and other industry stakeholders. The change has been endorsed by the Australian Meat Industry Language and Standards Committee. Current members of the committee include the Department of Agriculture and Water Resources, Australian Meat Industry Council, Sheep Producers Australia, Cattle Council of Australia, Australian Lot Feeders’ Association, Australian Pork Limited and Australian supermarkets/independent retailers. In coming months, relevant members of the Australian Meat Industry Language and Standards Committee will inform their respective red meat sectors of the changes and how they can apply the new definition, SPA said.